A couple of weeks ago, I received my official copy of Phil Gerbyshak's book "10 Ways to Make it Great!" I read it almost immediately, and I'm finally staking out enough time to write a review. For any of you who've encountered Phil, you'll remember it - he is a high energy, positive, and encouraging guy. I've often wondered, "Where can I get some of what Phil's been eating?" 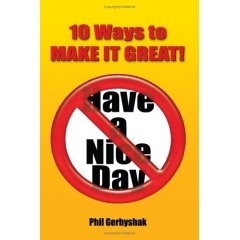 Well, in this book, Phil's bottled up some of that energy and relates some of the techniques he collected, developed, and perfected to move beyond a "nice day" world into a "great day" meme. 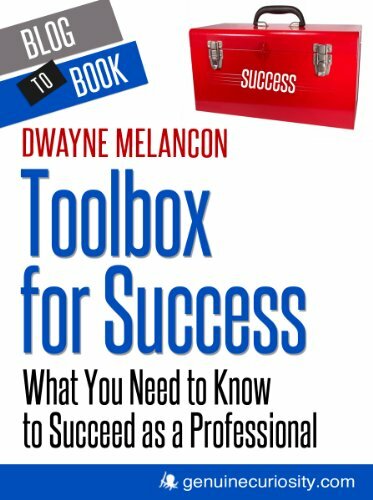 This is a small, carry-it-with-you kind of book and it contains 10 short exercises (mini-workshops is a good way to describe them) to help you make 10 concrete, significant changes to your life. Each of these changes is architected to drive a positive result in your life, relationships, and results. They also push for some healthy introspection to help you achieve better clarity of vision to focus your improvement. A lot of these techniques are similar to ones I've encountered along my journey of curiosity. Phil not only brings them all together in a very portable form, he adds his own unique perspective for a new angle on many of the themes. For example, we've all heard about the power of envisioning your desired outcomes. In chapter 7, "Dream Big Dreams, Do Big Things," Phil describes how to create a "dream room" to help you create a space where you go to dream. This provides a handy way to condition your mind to get ready to create new ideas, because you have a way to "suit up" for dreaming big. Pretty cool. As someone who tends to try to solve problems on my own, I've been trying to develop a new habit of asking for help sooner when I get stuck. Chapter 5, "Surround Yourself With Those Who Can Help You," gave me some new action steps that should help make my journey easier. Pick up a copy of Phil's book and carry it with you (it's under 70 pages). Then, when you find yourself having anything less than a Great Day, pull out your essence of Phil and get to work!